If you are a Ford purist, you may want to skip this article. The ubiquitous Chevy LS engine has a way to finding its way into just about any car brand/model with four wheels. 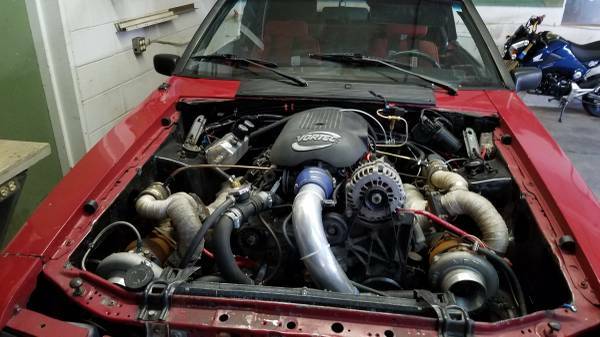 Seeing that DT readers take to engine swaps like bees do to honey we have today's featured pony car with a low mileage 5.3 LS engine out of a Chevy Suburban swapped into it. The owner took a page out of Emeril Lagasse's book and kicked things up a notch by installing twin turbos on the engine. 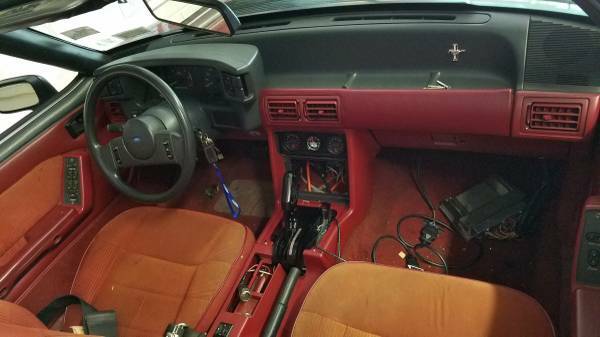 Find this 1989 Ford Mustang convertible for sale in Niskayuna, NY for $8,500 via craigslist. The seller has undertaken an extensive amount of work putting this creation together, but has decided to part ways with it due to a pending move. The 5.3 Suburban engine is mated to a 4L80E automatic transmission. The engine sports twin 62mm turbos mounted on flipped truck manifolds. The turbos and wastegates are eBay specials, but are said to work and perform fine without any smoke or issues. The wiring is handled through a PSI harness and engine has a base tune from HP Tuners. The AFR readings are right where they should be driving normally and stays +/- 12 while in boost. The timing is set low and boost is limited right now to wastegate pressure which is about 5 lbs. The downpipes have wideband 02 sensors in each bank with one tied into the HP tuners wiring. There are currently Cobra 50lb injectors and fuel pump installed, but the owner has considered switching these up. You may be thinking to yourself that this sounds like a whole lot of engine for a drop top car. 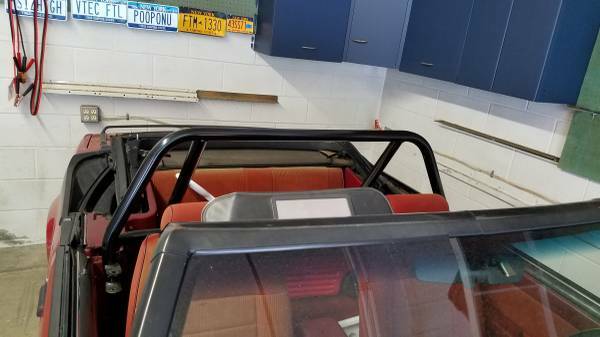 The interior does have a 6 point roll cage with removable door bars installed. The car also sports full subframe connectors. It appears this may have been a four cylinder car originally as the ad mentions the car sitting on 4 cylinder springs. The seller may or may not convert the rear drums to discs and change to 5 lug wheels depending on part availability and time. Cory is going to be detailing a 1995 Mercedes E320 sedan that is about to recieve a 3.6 engine and 5 speed transmission today. "has subframe connectors" I should bloody well hope! Ontheotherhand... 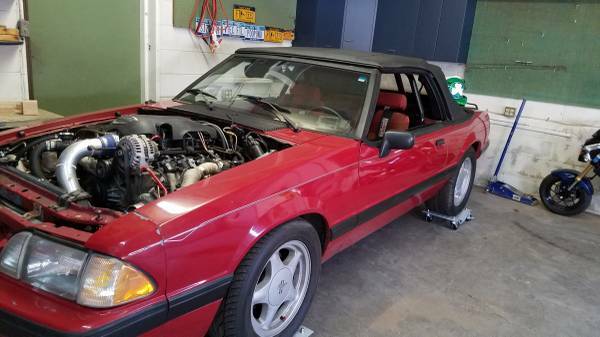 It would be interesting to see how much body damage you could inflict on a stock Fox convertible body with that much power and big, sticky rear tires. Nice to see that it actually runs and drives instead of "assembled but needs a tune". The seller should add a video to help move this thing along, seems like a pretty good deal.